Nicolas Trainerbees earned his nickname after more than two decades devoted to his association with animals and bees. Science Explorer reported that when he was 7, Trainer began to get into a lot of trouble at school because he was hyperactive, which eventually led to him dropping out. However, soon after leaving school, he found that cannabis for medical purposes helped him deal with his condition. Trainer admitted consuming it before he turned 10. He claims that he even trains them to behave in the way he instructs them, for instance, to collect sugar from fruits, instead of using flowers. When it comes to his “cannahoney”, he says that he uses a “training technique whereby the bees collect the resin and use it in the beehive”. His followers and friends asked him to train his bees to produce this nectar. He said that he knew the benefits of bee products like honey, propolis, pollen, wax, and royal jelly and the benefits of cannabis. 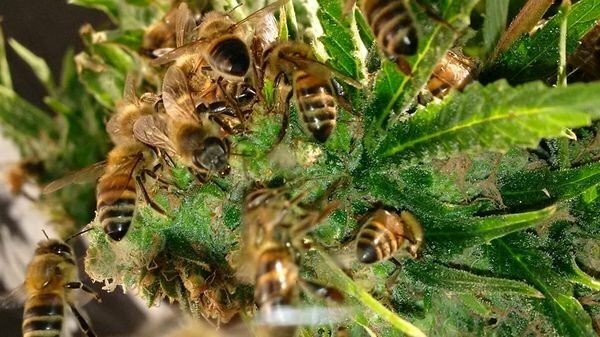 He says that everything that passes through the body of a bee is improved, so if the bee took the resin from cannabis it would also be very beneficial. He also explained that his bees that produce this product are not affected by cannabinoids, as they do not have an endocannabinoid system. He spent years testing his products and in 2013, he was finally happy with his work, as he created terpenes with “a delicious and pleasant taste” and aromas of a fresh plant. The color of “cannahoney” changes from light green to white or yellow, and it has a floral aroma. it should not be smoked, but it is ingested and it is good for health. Live Love Fruit reports that the benefits of cannabis and honey separately assure that their combination provides some powerful healing potential. Cannabis has been proven time and time again to help destroy cancer cells, while honey is a powerful anti-viral, antibacterial, anti-fungal, and one of the best natural immune system strengtheners. The consumption of cannahoney also relaxes the body a bit, gives you a minor buzz and allows you to relax and de-stress. As stress is the number one killer in America, we all need to find a way to lower it, if we want to live long, happy lives.